We are proud to offer a great collection of Silk Road Tours 2019! The Old Silk Road is a term used to describe an ancient network of trading routes between east and west established as early as 130BC. The merchant caravans traveled these old roads to bring silk and tea, dyes and precious stones, perfume and spices, medicine and ivory, rice and paper to the west. They returned home bringing horses and saddles, skins and furs, honey and fruit, weapons and precious metals. Central Asia, or the so-called 5-stans region, consisting of Kazakhstan, Kyrgyzstan, Tadzhikistan, Uzbekistan, Turkmenistan, is the exotic heart of the Old Silk Road. As you travel by train, you will have the opportunity to explore this ancient kingdom of stunning architecture, breathtaking landscapes, exciting history, art and religious ideas. 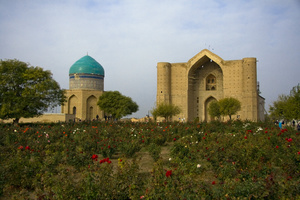 A unique 14-day tour from Kazakhstan, through Uzbekistan, ending in Turkmenistan. The Silk Road is filled with one-of-a-kind sights that have origins spanning thousands of years and thousands of miles. An ancient crossroads of Asia, Africa and Europe - modern-day Central Asia is a unique snapshot of how the ancient world used to be, made even more unique with a journey by private train. Retracing one of the most important trading routes of ancient civilization, the Silk Road follows in the footsteps of such legendary figures as Alexander the Great and Marco Polo. ALMATY - TASHKENT - SAMARKAND - BUKHARA - MERV - ASHGABAT - DARVAZA - KHIVA - VOLGOGRAD - MOSCOW Retracing one of the most important trading routes of ancient civilisation, the Silk Road follows in the footsteps of such legendary figures as Alexander the Great and Marco Polo. Beijing - Xian - Dunhuang - Turpan - Almaty - Tashkent - Samarkand - Bukhara - Merv - Ashgabat - Darvaza - Khiva - Volgograd - Moscow The Silk Road being one of the most important trading routes of the ancient civilization can be retracted following the footsteps of the legendary travelers - Alexander the Great and Marco Polo.